From award-winning author McCall Hoyle comes a new young adult novel, Meet the Sky, a story of love, letting go, and the unstoppable power of nature. It all started with the accident. The one that caused Sophie’s dad to walk out of her life. The one that left Sophie’s older sister, Meredith, barely able to walk at all. With nothing but pain in her past, all Sophie wants is to plan for the future—keep the family business running, get accepted to veterinary school, and protect her mom and sister from another disaster. But when a hurricane forms off the coast of North Carolina’s Outer Banks and heads right toward their island, Sophie realizes nature is one thing she can’t control. After she gets separated from her family during the evacuation, Sophie finds herself trapped on the island with the last person she’d have chosen—the reckless and wild Finn Sanders, who broke her heart freshman year. As they struggle to find safety, Sophie learns that Finn has suffered his own heartbreak; but instead of playing it safe, Finn’s become the kind of guy who goes surfing in the eye of the hurricane. He may be the perfect person to remind Sophie how to embrace life again, but only if their newfound friendship can survive the storm. Meet the Sky is an ably-written, well-paced contemporary YA—one which is perhaps best described as a pleasantly stormy beach read. The weather also becomes a sort of additional character, as the nuances of riding out a severe hurricane forms an integral part of the plot. Readers who’ve never lived near hurricane-affected coastlines, or experienced a related mass-evacuation, are in for a fascinating experience. Sophie was a bit harder to connect with than the heroine from Hoyle’s debut. She’s bitter, pessimistic, overly judgmental, and a notable control freak. There are several justifiable reasons for this, however. (Her sister has a traumatic brain injury from a car wreck—which drove her father to first alcoholism, and then to abandon her family. Her overworked mother is barely getting by, and Sophie is burning her candle at both ends trying to compensate for all the brokenness around her. Yet at the same time, she’s still clinging to her dream of becoming a veterinarian.) Needless to say, the setup leaves plenty of room for growth in Sophie. And in terms of character development, Hoyle delivers. The conflict with Finn sometimes felt a touch contrived. So, the guy disappeared in the middle of Sophie’s Freshman year, leaving Sophie high and dry at a school dance (and inadvertently compounding her abandonment issues.) She’s now a high school Senior, who seems overly determined to nurse a grudge when Finn suddenly resurfaces. Finn actually has a solid excuse for his vanishing act years earlier—which doubles as justification for his devil-may-care surfer-boy attitude. But as direct as Sophie is, she doesn’t bother confronting or questioning him on the presumed offense until they’ve been thrown together in a dangerous predicament. And once they finally get that part sorted, they go their separate ways for a while—which seemed to neutralize the chemistry to some degree. 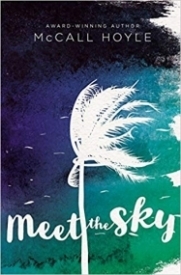 Meet the Sky presents a unique setting, a harrowing situation, and an opposites-attract romance that moves organically within the plot rather than overwhelming it. The story is one of love, loss, and reclamation—of all the things in life that are outside our control, and the attitudes that aren’t.